Breadcrumbs are a wonderful addition to casseroles, macaroni and cheese, and baked seafood and pasta dishes, while croutons bring a nice crunch to salads. While you can make dry breadcrumbs without toasting them in butter or oil, adding this step contributes flavor and helps them keep their crunch longer. Croutons and toasted breadcrumbs are super easy to make with day-old bread, rolls, or croissants and can be stored to use throughout the week. And crostini, small toast rounds, follow a similar preparation method and are perfect to top with ingredients for a tasty hors-d'oeuvre. When baked, buttered breadcrumbs add color, crunchy texture, and butter flavor. Buttered breadcrumbs are often used to top casseroles, such as cheddar green bean casserole, where they are added before the casserole is put in the oven and toast while the casserole bakes. For other uses, such as on vegetables, soup, or salad, you can toast the buttered breadcrumbs on the stovetop before using them to top the dish. Mix 1 cup of the soft breadcrumbs with 2 tablespoons of melted butter. Toss or stir with a fork to thoroughly coat the crumbs. If you are adding them to a macaroni and cheese or another casserole, at this point you can put them on top of the dish. To toast the soft buttered breadcrumbs for other uses, put them in a nonstick pan over medium heat on the stovetop. Cook, stirring constantly, until browned and somewhat crisp. Now they are ready to top any dish and will retain their crunch longer than plain dry breadcrumbs. You can use olive oil to make both toasted breadcrumbs and croutons. They will retain their crispness when used in soups, salads, or as breading. To make, toss torn or cubed bread pieces with about 2 tablespoons of olive oil for every 1 1/2 to 2 cups of bread. Spread them out on a baking sheet and sprinkle them lightly with kosher salt. For seasoned breadcrumbs or croutons, sprinkle lightly with garlic powder and dried herbs, such as basil or parsley flakes. Bake in a preheated 350 F (180 C) oven for about 10 to 15 minutes. Use the croutons on salads or soups. 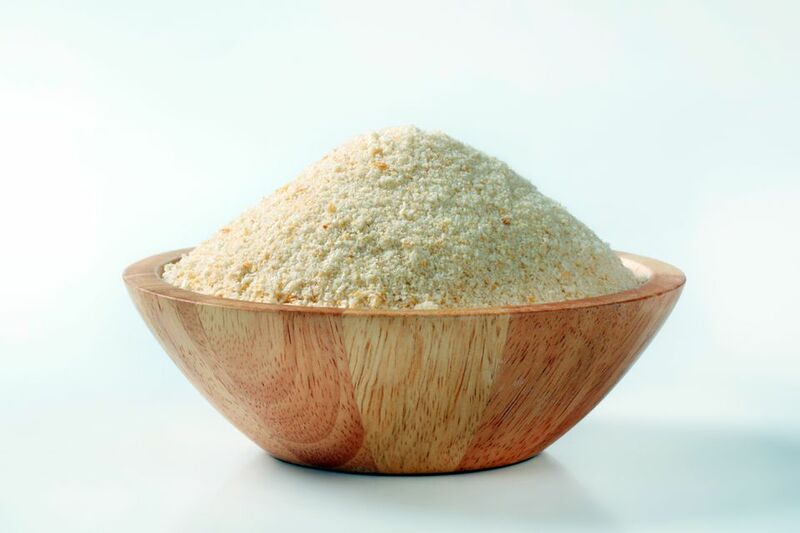 Finely ground toasted breadcrumbs make a great substitute for purchased fine dry breadcrumbs and can be used as a casserole topping, breading, or as an extender in meatloaf or meatballs. To make the toasted bread cubes into breadcrumbs, pulse the toasted bread pieces in the food processor until they are coarsely or finely ground to your liking. Crostini are a great appetizer base and are quick to make; they can also be enjoyed with soup or salads. To make crostini, cut a French bread baguette into thin slices. Brush both sides of the slices with olive oil and sprinkle with sea salt and freshly ground black pepper. Bake in a preheated 375 F (190 C) oven for about 10 minutes, turning the crostini about halfway through the baking time. Sprinkle with grated Parmesan cheese, if desired.